17 Food Services Delivering Vegan Meals To Your Home we wrote about last week. These come ready to eat! You just have to heat them up. You can even keep them in your freezer for a rainy day. They are aiming at athletes, so their fully-vegan meal option is built with performance in mind. Pea soup just isn't going to cut it when you need energy to get through the day. Although there are many meal delivery services, they each offer a different selection of dishes suited for the general population people. Some have vegan options from time to time, but it's not always their intention. There simply aren't that many services that specialize in vegan fare. I decided to review some of them to help anyone interested in prepared vegan meals services. I was able to come up with a list of 17 services, but if you know of more, please leave a comment and I'll add them to my list. As I review each one of these, I'll include a link to the full review on this page. Some of the companies focus on vegan meals entirely. Others don't but make it easy to select vegan meals in some way. There are probably 100 different companies offering this style of food delivery, and I'm working my way through all of them (non-vegan included). Some of the other areas I'm looking at include gluten-free, organic and, paleo meal companies. 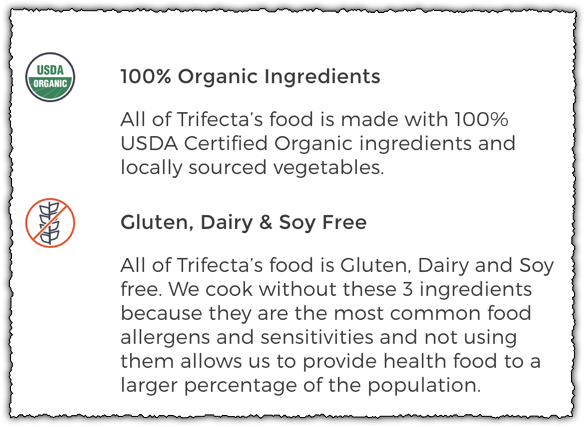 Trifecta Nutrition offers meals that are 100% organic, non-GMO, gluten-free, never frozen, and soy-free. All of these areas are perfect if you want natural foods. The meals service has several meal plans including Classic, Paleo, Clean Eating, Vegetarian, and Vegan. The food service delivers meals to all corners of the United States as well as Alaska and Hawaii. Shipping is always free, regardless of where you live. Their delicious meals come in chilled vacuum sealed containers. Serving chilled meals helps ensure that the nutrients remain intact. Plus, frozen meals often lose some of their flavor and texture during the thawing process. You can always freeze them yourself if you want to. Trifecta offers a vegan meal plan with various frequency options. The Vegan Meal Plan starts at $113.90 per week. That price provides you with two meals (one is breakfast) for five days each week. This averages out to $11.39 per meal. You can customize the order, choosing between two, three, or four meals per day and either five or seven days per week. In each case, you can also select whether you want breakfast as one of those meals. The changes alter the price, with the highest option being $293.72 per week (around $10.49 per meal). There is also an A la Carte menu. But, this just lets you order components separately rather than full meals. For example, this menu includes 1 lb of quinoa for $8.99 per week and 2 lb of asparagus for $18.99 per week. Trifecta is eco-friendly and relies on organic foods from local farmers. Meals are also delivered in a recyclable package. After placing an order, they provide information about the range of both macronutrients and calories. It helps anyone who wants to strictly and consistently stick to a set number of calories and macronutrients in your meals. On the other hand, they have a high minimum order requirement which excludes a majority of people who want to make smaller orders. Veestro is an entirely plant-based meals service. The dishes are all organic, non-GMO and free from preservatives. There is also an emphasis on creating dishes that look and taste interesting. Because they specialize entirely on plant-based meals, Veestro tends to be much more creative with their vegan meals. In contrast, companies that just have a single vegan meal plan are often more limited. Veestro has four overall categories: an A La Carte menu, Liquid Cleanse, Weight Loss, and Meal Packs. The Liquid Cleanse simply provides juice, which is half blended and half pressed. There is no added water or sugar. The other plans all contain meals. The main option is the Meal Packs, which are designed around specific goals. For example, there is a Starter Pack, a Protein Pack, along with a Gluten-Free option and a 21 Day Kickstart. The packs start at either $8 or $9 a meal and most contain 20 or more meals. All of the dishes are frozen and you receive an entire pack at once. Most of the packs are one-time orders only, although a few have subscription options. The Weight Loss Program operates more like a conventional meal plan. With it, you choose to receive meals for three, five, or seven days. You can get these every two, three, or four weeks, with each shipment containing two weeks worth of meals. The price is $209 for the three-day option. The style is still a little unusual and slightly confusing. But, it could be appealing if you want to lose weight. Neither of these options lets you choose your own meals. You have to turn to the A la Carte menu for that. Here, the meals range in price from around $10.99 to $12.99, although there are some cheaper desserts, juices, and sides present too. The selection is decent enough but it mightn't be enough if you want meals every day of the week. Veestro is an entirely plant-based company with some interesting, albeit unusual, ways to order. They charge shipping fees based on your order. For instance, orders below $98 come with a $35 shipping fee. Orders totaling $99 to $189 come with an additional $19 shipping fee, and shipping is free on orders above $199. If ordering from California, you will pay a fixed $12 shipping rate for orders below $198. The meals service ships to all parts of the United States, including Hawaii and Alaska. You receive your meals in insulated boxes with clear storage instructions. Delivery time varies depending on your location. Since its inception, MamaSezz has been preparing delicious plant-based tasty meals and snacks. They take the hassle out of healthy eating by delivering ready-to-eat, tasty, and satisfying meals to your doorstep. They do not use oils, dairy, preservatives, or refined sugar for their meals. The dishes are all organic and gluten-free as well. MamaSezz provides two ways to buy. First, you can purchase meals individually through their menu. The options change over time and include season items like Plant-Based Cornbread and Cornbread Sage Stuffing. Prices vary dramatically, especially as some of the items are sides and others full meals. But, as an indication, sides are often somewhere around $6.99, while full meals are often $15.99. You can also order meals in bundles. These currently cost either $89 or $99 each. The bundles include options like Family, Get Me Started, Healthy Holidays, Healthy Senior, and Just For Me. They can be ordered individually or on a subscription. In each case, you get a themed selection of some of the meals from the company at a discount. The price difference isn't dramatic but the bundles mean you don't have to stress about exactly what to order. MamaSezz offers larger servings than most companies, while retaining a strong focus on quality. The meals service offers local pick up for people living in Keene, Brattleboro, New Hampshire, and Vermont. If you place an order by 8 pm Eastern Time on Sunday, they will deliver your meal in an eco-friendly cooler either by Thursday or Friday the following week. They deliver to three zones and the shipping costs vary between them. But, in general, you need to order more than $89 worth of food to be eligible for free or reduced-price shipping. There is no minimum order size, so you can order small amounts, as long as you don't mind the shipping charges. FoodFlo is a premier French chef-driven meals service based in Los Angeles. The food service delivers alkaline, healthy, plant-based, and gluten-free meals. They source sustainable and organic produce to prepare their meals. The meals service ships to Nevada, Orange County, Arizona, and California. All their meals are non-frozen, hand-made, and always fresh. Florence Bertheau, a French-born Gourmet chef, is the founder of the FoodFlo meals service. The alkaline focus is probably the most unusual aspect of the company and this approach is meant to help promote growth and repair of the body. All meals from FoodFlo are prepared using Kangen alkaline water and fresh ingredients with high-quality vegan proteins. Their menu only contains non-GMO food, they rarely use soy, and if they do, they make sure to mention it. The company creates unique menus every Tuesday, and they professionally pack your meals alongside serving instructions. Their customer service is friendly and caring, and the meal portions are generous to give you enough satisfaction. FoodFlo offers a vegan meals service with a strong emphasis on alkaline foods. Deliveries to the Los Angeles County and Orange County are on Mondays 9 am to 5 pm. They also ship overnight to Las Vegas, California, and the metropolitan areas of Reno, Tucson, and Flagstaff in Arizona. The meals service ships orders on Monday in the afternoon, and you receive your order on Tuesday. They customize their menu to accommodate people with allergies as long as you notify them by Friday before the next delivery or when placing your order. Although they allow you to cancel your order through email, you can only suspend your subscription once per billing cycle. FoodFlo's meal charges range from $11 to $30 per plate, and they charge $15 for each cooler bag they leave with you. They have no minimum order amount; you will pay $10 for shipping on orders less than $134. Popular music sensation Beyoncé and her trainer Marco Borges are the co-founders of 22 Days Nutrition. Its establishment came after Beyoncé and Jay Z went vegan for 22 days. They provide 100% organic, soy-free, vegan, and gluten-free meals to your doorstep. 22 Days Nutrition delivers either a weekly meal plan which comes with three options or an A La Carte option. They prepare a menu with 15 different recipes, and you place an order of your choice. With the weekly plan, they deliver orders on Fridays, but for the A La Carte plan, they ship out orders within two days after placing an order. The meals service offer six breakfast recipes and nine lunch/dinner recipes on a weekly basis. They ship to all parts of the continental United States. They allow you to switch delivery location as long as you change the details ten days before the scheduled shipping date. 22 Day Meals offers three main plans, along with the ability to order A la Carte. Their breakfasts cost $6.95 per meal while the lunches/dinners go for $12.95. The minimum order amount is $75, which seems steep but a good option when having a dinner party. You can choose a weekly meal plan and your number of daily meals. The 5-day meal plan starts from $12.50 per meal, and if you prefer three meals per day, it will cost you $187.50. For the 7-day option, the price is $11.50 per meal and $241.50 for three meals per day. On the other hand, the 22-day meal plan cost $9.50 per meal or $627.00 for the entire duration with three meals per day. They provide free shipping on the third week of the 22-day meal plan but charge a $20 weekly fee for the first two. The meals service also offers an auto-ship service with a 5% discount on each order. You can skip or even cancel the auto-ship whenever you feel like as long as you do it ten days before your next scheduled delivery date. Sadly, the auto shipping option is not available for the 22-day meal plan. NutriFit is a meals delivery service based in Southern California that delivers across the United States. They only use fresh and high-quality ingredients to prepare their tasty meals. You can get your meals delivered up to three times weekly, and your meals arrive in a NutriFit cooler. With the customization option, you can order a combination of breakfast, lunch, dinner, and snacks to meet your nutritional needs. They have various programs that are helpful for gaining, losing, as well as maintaining weight. Their delivery areas include Los Angeles, Orange County, California, and Ventura. Jackie Keller, who is a licensed and certified wellness coach, is the founder of the NutriFit meal delivery service. They also offer weight loss and wellness coaching on their website. The food service prepares customized and personalized meals according to your specifications. They gather their ingredients from the local and sustainable farm to come up with a healthy selection of dishes. Their food does not contain preservatives, and they also have gluten-free, dairy-free, vegetarian, and vegan meals. NutriFit offers very impressive customization options but this results in an expensive service. There are two general plans on offer the cover all of the different options. The first is Essentials. This allows you to choose whether you want breakfast, lunch, and/or dinner. You can also pick calorie levels and up to eight ingredient exclusions (with some exceptions). If you order for 28 days, this plan charges $17.95 for breakfast, lunch or dinner. Having all three costs $41.95 per day. The Premium plan allows for more customization – and basically lets you make your own personal meal plan. Vegans will probably need this plan. Here, breakfasts are still $17.95, but lunches are $18.95 and dinners are $28.95 (some extra components are included). Getting all three meals costs $54.95. You can also order daily with both plans. The prices increase again if you do so. They generously portion the meals and the level of customization is extremely appealing. But, the cost is very high. The service would only be worth it if you needed that level of customization. 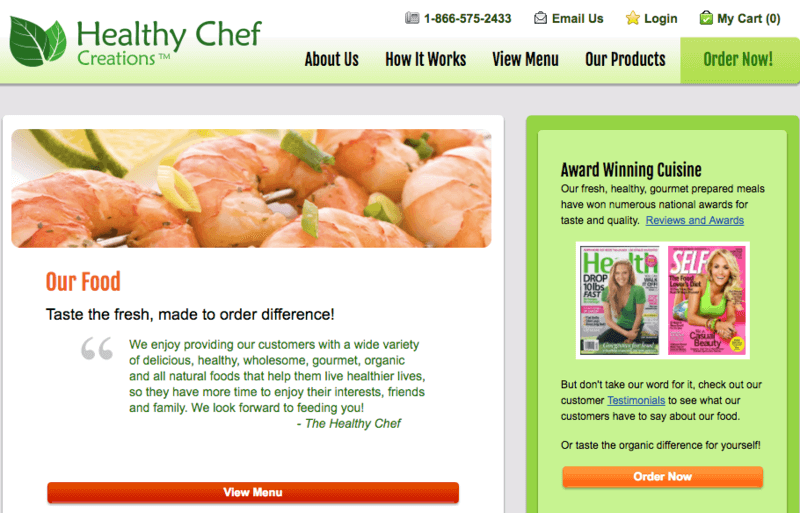 Since its inception in 2001, Healthy Chef Creations has been a popular national provider of healthy cooked meals. They deliver wholesome food to promote good health and have a wide range to choose from. You can order meals individually through their A la Carte menu or you can sign up for one of multiple services. These allow you to get breakfast, lunch, and/or dinner in various combinations, depending on the plan that you pick. You can place an order by phone or online to tailor your meals according to your liking. They pack your food in insulated BPA-free boxes and ship them overnight. The meals arrive fresh, never frozen, and ready to heat and eat. The plans also offer various adjustments, such as the number of calories in a meal or the size of your meal. Healthy Chef Creations doesn't have a vegan menu but they do allow you to specify your dietary needs. There is no specific vegan menu provided. However, Healthy Chef Creations allows you to specify multiple dietary preferences – so you can get vegan meals this way. This is a powerful option and helps make sure you get meals that are perfect for your needs. The meals service has several delivery dates, and each has a different menu. All their deliveries arrive on Fridays, but you are free to skip or change your orders provided you notify them eight days before the delivery date. To make things easier, you can enable the automatic renewal option. You will then get your meals delivered every week without repeating the ordering process. Their professionalism and quality give you a reason to make repeat orders. The prices of the plans vary and change as you select different options. But, as an example, the Healthy Living Breakfast, Lunch & Dinner plan starts at $49.99 per day, while the dinner-only version starts at $17.99 per day. Other plans that offer three meals also start at $49.99 per day, although they provide different customization options. With its location in San Francisco Bay Area, The Vegan Garden delivers plant-based meals. The service offers various packages and plans for you to choose from. Some of these are one-time orders, while others allow for subscriptions. They professionally prepare their meals using high-quality and sustainably sourced ingredients. Their meals accommodate various groups of people including anyone who wants to avoid gluten, those who want quick, healthy meals, and if you need meals designed for weight loss. They give room for customization which allows you to try out different options. The Vegan Garden is slightly confusing but offers a low price per meal and multiple options to choose from. The U Pick Em Plan costs $199 per month while the Taste Great Lose Weight Plan goes for $520 per month. The Don’t Sweat It and Oldie, But Goodie plans go for $499 per month. The It’s Okay To Be Different Plan goes for $543 per month, the 5 Day Platinum Weight Loss Plan costs $450, and the 7 Day Platinum Weight Loss Plan at $580. 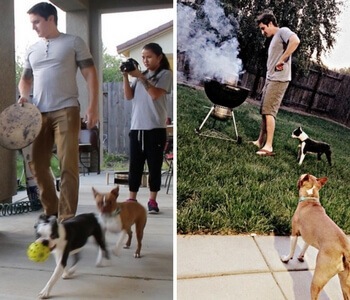 Each of their meal plans comes with a two-month contract. Most offer limited personalized – although there is a Customized meal plan that allows you to choose your own meals. The prices all seem high but most of the plans offer three meals (plus desserts) each day for seven days a week. For example, the Tate Great Lose Weight Plan calculates out to around $17 per day. That's lower than most other companies. Many others charge around $17 just for one meal. They deliver to all parts of the continental United States, but they do not ship to Alaska and Hawaii. Their shipping cost per package may go up to $65, but for deliveries in California, they charge a flat $19 rate. They include a $29 shipping cost per order for shipments to all other parts of the country. Bulk orders get free shipping. On their shortcomings, if you cancel your subscription, they will charge you half the amount for your canceled order. Paleta is a meals service that delivers haute cuisines made using fresh ingredients. Chef Kelly Boyer, the Chief Executive of Paleta, got the inspiration after surviving cancer. She attributes her recovery to changing her diet and nutrition. She created the food delivery service back in 2005 right in her home kitchen. Paleta boasts of being the first certified green kitchen in Los Angeles. They source ingredients from responsible fisheries, local farms, and cruelty-free ranches. The plant-based meals service allows you to personalize your order according to your desired nutritional needs and you can choose only vegan options. They are eco-conscious and socially-responsible meal delivery service. Your food arrives in a recyclable and biodegradable container to help eliminate waste.They have six Paleta meal plans, and each allows customization. Paleta strongly focuses on healthy ingredients and offers various meal plans to choose from. Examples of their plans include a Paleo/Gluten-Free Plan, the Market Menu (which follows Mediterranean principles), vegan and vegetarian options, and a 14-Day Weight Loss Kickstart. Prices vary depending on the option that you choose – and details aren't provided for the vegan meals. However, for the Paleo/Gluten-Free Plan, there are three size options. Fit costs $49 per day and provides 1,200 calories. Lifestyle costs $59 per day and contains 1,600 calories. Performance costs $69 per day and contains 2,200 calories. Those prices are for three meals plus dessert. The prices may decrease if you want fewer meals but you'd have to contact the company for details. Vegin' Out joined the food service industry in 2000, and they deliver all vegan meals.The meals service also has a good selection of vegetarian and gluten-free dishes that they ship out every Monday. You can customize your orders by including your preferences in the special request box. Their ingredients are naturally sourced and they rely on organic options wherever possible. Their meals also have a low fat content and are free from trans fats. Every week they create eight unique dishes to make up their meal packages. They pack your order in an insulated cooler bag along with ice packs to keep it cool for two to four hours on the delivery day. Vegin' Out just offers two main plans with limited flexibility. But, the food does look interesting at least. There are just two options to choose from, single and double. Single contains three entrees, four side dishes, one soup and five cookies. Double is just double that. The components are based off the company's weekly menu. You can request exclusions of some ingredients, although this will just result in doubles of other meals as a result. The price varies depending on where you live. For people in Los Angeles, a single box costs $127.99 and a double costs $234.99. For people in North California, South California, and Arizona the single costs $145.99, while the double costs $259.99. For people elsewhere in the nation, the single costs $189.99 and the double costs $360.98. To order additional entrées, it will cost you $13 per plate and $6 for extra vegan cookies (five pieces). For a side dish, you will pay $11 each, and the rate for salad dressing is $0.50 each. California Chef Services delivers prepared meals in Los Angeles. The style is different than most, as the company literally acts as a personal chef. This means that meals are prepared for you on an individual basis. This also allows you to specify multiple dietary preferences or needs, which is incredibly unusual. California Chef Services is an expensive service but it provides more customization options than most others. Since they use fresh ingredients straight from the farm, their food remains fresh for a significant amount of time. Your first delivery comes with a welcome letter with helpful information, such as food safety tips and the heating instructions. You can freeze all your meals except for the salads. They pre-label your meals with the name of the dish and meal type. Each meal comes accompanied by a snack. They deliver to various parts of the Oaks area and the Greater Los Angeles region. Their Diet Meal Delivery prices per person are; dinners go for $25, while lunches and dinner packages will cost you $38. For three daily meals (breakfast, lunch, and dinner) you will pay $46. Three meals and snacks go for $54, and four meals per day cost $56. The prices for the Family Meal for three nights costs $132 for two, $198 for three, $240 for four, and $300 for five, and $360 for six servings. They do not deliver to all parts of Los Angeles, and they charge additional delivery fees. The prices are higher than many other companies. But, this isn't so surprising as you are paying extra for the personalized nature of the service. Kitchen Verde is a plant-based meal delivery service promoting disease prevention, optimal health, and weight loss. They create flavorful and delicious meals from natural foods. Almost all their fresh ingredients come from their very own greenhouse. Kitchen Verde provides delivery for $5 for Monroe County residents or you can pick up meals locally at the Sands Cancer Center on Mondays if you are an Ontario County resident. They don't deliver to any other areas. All their meals are 100% plant-based meaning that they exclude animal products entirely. You can also find a decent selection of gluten-free options, and they label each as (GF). Their meals stay fresh up to seven days as long as you keep them refrigerated. They recommend freezing the meals within two days of receiving them so that they can keep for longer. Kitchen Verde only serves a limited area but their meals are inexpensive, fresh, and very appealing. The meals service does not use any preservatives, and they do not use any oil for cooking. They cook foods that typically require oil using vegetable broth. They also use parchment paper to prevent meals from sticking while cooking. They do not refund or give credit for orders that are left or forgotten. In their menu, a breakfast goes for $7, lunch or dinner meals typically cost $9 or $10, and snack boxes go for $5. Their organic cold-pressed juice costs $9, while desserts cost $6, and they have various gift cards available. This makes them an inexpensive service for people in the area. With its location in San Diego County, Veggie Vibes is a raw organic vegan meal delivery service. They deliver meals on Thursdays overnight, and they also cover Hawaii and Puerto Rico. The Veggie Vibes menu is purely plant-based, free from artificial ingredients, gluten, and highly processed flours or sugars. They only use organic raw coconut oil, cold pressed olive oil, raw natural coconut sugar, raw coconut oil, dates, and natural agave nectar for cooking. Most of their produce comes from the local organic farmers. Their menu includes a combination of salads, smoothies, power shakes, raw dehydrated items, juices, plant-based desserts, raw snacks, and soups. Veggie Vibes has four meal plans. The first is Alive, where a single order for three days goes for $188, five days $294, and seven days for $392. The Reset Cleanse costs $158 for a single order for three days, five days at $225, and seven days at $307. The Savory Raw costs $158 for a single meal for three days, five days at $216, and seven days at $281. The Your Selection plan costs $188 for a single meal for three days, five days at $294, and or seven days at $392. Veggie Vibes focuses on vegan, raw, and mostly organic meals – and includes some interesting dishes and styles. The plans are all different in what they offer. The most interesting is the Your Selection plan, which allows you to choose exactly what you receive every week. This offers considerable flexibility. Unfortunately, they do not have an order customization options which means they lock out people with various allergies from using their services. They only deliver once in a week (Thursdays), and they also charge a shipping fee. There are many good things about Fresh n’ Lean but the company is a little confusing when it comes to the vegan diet. They use the term vegan multiple time in their marketing. Yet, many of their meal pictures include meat. The simple answer is that the company does both. They offer two meal plans that use animal protein and two that are vegan. The first vegan meal plan is just called the Standard Plant-Based Meal Plan and starts at $9.33 per meal (when not on special). The other is the Low-Carb/Low Cal Plant-Based Meal Plan, which starts at $11.33 per meal. The latter is designed for weight loss, although both plans are healthy and have a good balance of nutrients. Fresh n' Lean offers two vegan plans, both of which contain appealing meals. With either plan, you can choose how many meals you receive per day and how many days per week. You can also add other components, including snacks, entrées, and sides. But, the additions aren’t clearly labeled as vegan or not, so you’ll have to read the ingredients labels closely. Fresh n’ Lean also includes a calculator for helping you see your average nutrient intake each week, based on the plan and additions that you choose. You can also ask for up to three ingredient exclusions (which won’t be included in the macro calculation). But, you don’t get any choice about the meals themselves on this plan. Instead, you receive whatever is on the menu for the week. If you like variety and an easy system, this style may be perfect. On the other hand, if you prefer to make your own choices, the plan may not be appealing. You can buy meals individually too but the selection is limited. Plus, you have to order at least $90 of meals per week when doing so. Sakara is a 100% plant-based company with a strong emphasis on clean and organic meals. The dishes are also free from gluten, dairy, refined sugars, and GMOs. The company takes this a step further as well, emphasizing concepts like probiotics, phytochemicals and detoxing. The choices of ingredients mean that Sakara dishes are generally vegan. However, Sakara does mention that they use honey and bee pollen in their meals. If this is a problem, you can let the company know and they will exclude all animal products (for an additional fee). The overall style has made the company pretty famous as well, especially with the current popularity of clean eating. Many of the meals end up looking like something from Instagram and they are certainly pretty. You also get Beauty Water with breakfast/lunch, Detox Water with dinner and Detox Tea regardless of your order. This is something most other services don’t provide. Sakara is strongly plant-based with healthy meals. But, they do use honey and pollen by default. There are two main options to choose from. The first is a Taste It plan, which simply provides meals for one week. The other is the Live It plan, which provides a recurring weekly subscription. In both cases, you get to choose which meals you receive (breakfast, lunch and/or dinner), along with the number of meals per week (three or five). Pricing may be different for some locations, but I was able to get a general idea from the website. The main program starts at $239 per week for three days and $420 per week for five days. These prices include all three meals for each of the days. One personal issue is the company’s website. It’s simply a pain to use, forcing you to sign up before it gives you pricing information or details. Even then, information is provided poorly and you have to step through multiple screens to learn what you need. That’s always frustrating. You’ve probably seen Schwan’s around before, as the company offers an extensive range of frozen dinners, desserts and snacks. They also offer a delivery service, allowing you to get many of their meals delivered directly to you. There are no set meal plans here. Instead, Schwan’s allows you to order the meals that you’re interested in. The style is perfect for stocking up your freezer and making sure you always some ready-made dinners on hand. The meals can be ordered online or through the company’s app. Schwan's offers frozen dinners, with the advantage of fairly low prices and a wide selection. Prices of the meals vary considerably, anywhere from around $4 to $25. The more expensive ones tend to be larger and/or contain more specialized ingredients. The LiveSmart range from Schwan’s is particularly relevant for health, as it focuses on meals that are good for you. This line includes some vegan meals, along with ones meeting other dietary requirements. Schwan’s may not specialize in vegan meals but it is still an interesting option. If nothing else, they are a large company with a wide range of products. This aspect alone should mean there are some meals that work well for your needs. Thistle is a fascinating plant-based meal company. The most significant aspect is the ingredients chosen. Thistle heavily focuses on superfoods, which includes ingredients such as hemp, matcha, turmeric, and spirulina. They also average around 5.8 different fruits and vegetables per meal, which is impressive. The dishes themselves look like something from Instagram and many different styles are included. Despite the plant focus, Thistle isn’t entirely vegan or even entirely vegetarian. Instead, there are two options with ordering. Vegan is the default, so it’s clear that Thistle heavily specializes in vegan food. But, there is also a meat option, for an extra $2 per lunch and dinner. Thistle offers many unconventional meals and heavily relies on superfoods. Thistle only has a single meal plan but you can customize it in multiple ways. This includes choosing whether you want breakfast, lunch, dinner and/or juices each day. You can also select between three, four, five, and six days per week. Plans can be adjusted as you need them and you can cancel at any time. The overall price and the price per meal varies depending on what you choose. For example, vegan dinners for three days a week costs $41.97 per week, which averages out to $13.99 per meal. In contrast, if you want breakfast, lunch, and dinner for six days, the cost is $207 per week. That one averages to $11.50 per meal. The choice is yours. Shipping is free regardless of what you choose. The customization options are powerful, especially as many companies offer fewer. But, you still can’t choose the specific meals you want. You also have to have the same pattern each day. So, you can’t have six dinners and three lunches a week, for example. There is also no A la Carte menu, so you only have access to what is on the menu each week.